Other Family Data Daughter: Anna Frenkel née Ginsbourg (b. July 3, 1911, Samara, Russia; d. August 18, 2001). Son-in-law: Jacob Nahum Frenkel (2C7). Grandchildren: Robert Baruch Frenkel and Emily Helene Frenkel. Historical Lived in Harbin, then Shanghai, then Hong Kong. He served as a provincial high court judge in Shanghai. His daughter (Anna) graduated from law school at Oriental University in Harbin in 1933. In 1935, she became the secretary of the International League for Cultural Cooperation in Shanghai. After WWII, she moved to Australia. She is mentioned in many books and she, herself, edited books and papers. After she and Jacob Nahum divorced, Anna and her two children lived in Sydney suburb of Lindfield. She is buried in Macquarie Park Cemetery. A Maria Davidovna (b. 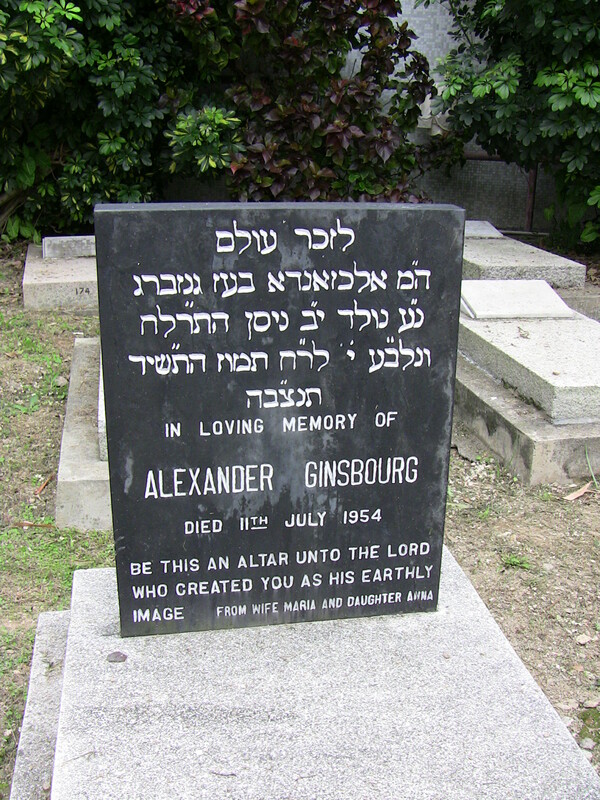 March 10, 1877, Minsk; d. April 26, 1972, Sydney) is buried in Macquarie Park Cemetery. In 1963, she lived at 28 Lugar Street, Waverly, NSW. She may have been Alexander’s wife.